Jo Seon-ho's "A Day - 2017" (Kim Myung-min and Byun Yo-han) arrived last Wednesday and came close to toppling the latest "The Mummy" reboot at the top of the pile. Jo was the assistant director for four previous films (including "Killer Toon" and "Once Upon a Time in Seoul") but "A Day - 2017" is his first in the driving seat. Like the 1993 American drama "Groundhog Day", the film's protagonist finds himself caught in a loop as he frustratingly relives the same day over and over again. This day, however, is tragic because the lead's daughter is killed in an accident and he has to rush around to try and prevent that from happening, again. From 781 screens around the country, Jo's debut captured 28.36% of the sales (480,790 admissions), just 18,000 less than this week's reigning feature. Alex Kurtzman's remake of "The Mummy" entered the fray at the beginning of the month and went straight to number one last weekend. 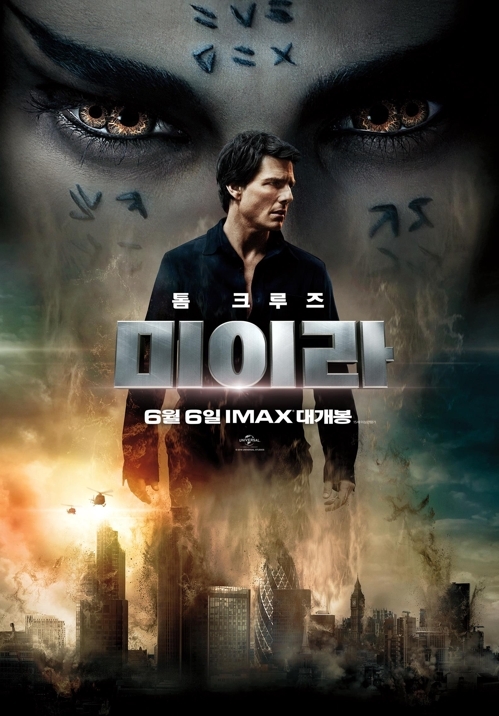 Week two from Kurtzman's action outing (which stars Tom Cruise, a popular talent in Korea) saw it add 498,268 admissions (30.11%), which brings its total tally in Korea now to 3.2 million, or $23.8 million. Currently, "The Mummy" is the sixth highest-grossing film of the year behind the most successful Japanese anime of all time, "Your Name" (3.6 million admissions) and the high-octane American film, "Fast and Furious 8" (3.6 million). Last weekend's number two, Jung Byung-gil's action film "The Villainess" starring Kim Ok-bin, grabbed 14.85% (247,163 admissions), followed by one of the most popular superhero films of the year: DC Films' "Wonder Woman". Worldwide, Patty Jenkins' modern update on the classic DC hero has made over $571.8 million; in Korea, the film's weekend haul of 128,632 admissions (7.56%) now pushes DC's latest to just over 2 million admissions ($14.8 million). "Our President", a documentary by Lee Chang-jae about the former South Korean president, Roh Moo-hyun, remained unmoved in fifth with 84,115 admissions (4.88%). Although the film is only nineteenth in the list of the year's top performers, it is the highest nonfiction film of the year with just under 2 million admissions (1.7 million, or $11.98 million). The fifth instalment in the popular "Pirates of the Caribbean" series of films, "Pirates of the Caribbean: Dead Men Tell No" (with Johnny Depp, Javier Bardem, and Brenton Thwaites), fell two places to settle in sixth with 73,499 admissions (4.39%). In addition to Jo Seon-ho's debut, only three other new films made it into this weekend's top ten, all of which are foreign animations: "Big Fish & Begonia", an epic fantasy from China, captured 1.84% of the sales (32,520 admissions) during its first weekend out; "Richard the Stork" and "MULLEWAPP 2 - A Pig's Tale" from Germany earned 1.56% (29,087 admissions) and 1.02% (19,520) respectively. The final spot fell to DreamWorks Animation's "Boss Baby" starring Alec Baldwin and Steve Buscemi. "The Boss Baby" (based on the children's book "The Boss Baby" by Marla Frazee) has been active in Korea's top ten since early May, and with the 9,487 admissions (0.49%) the animation claimed here, the film's bottom line in Korea now moves to 2.4 million, or $16.6 million. [Photo] Updated cast and added poster for the upcoming Korean movie "The Mimic"
[Video] Added 2nd main trailer for the upcoming Korean movie "A Taxi Driver"